Dr. Anam Shaikh was born in Queens, NY. She now lives in upstate NY and practices medicine at The Center for Rheumatology's Schenectady office location. 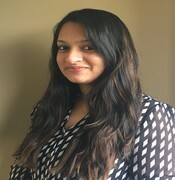 Dr. Anam Shaikh completed her Doctor of Osteopathic Medicine from the New York College of Osteopathic Medicine in 2012. She completed her American Board of Internal Medicine certification in 2015. She has published research focused is many areas of medicine including arthritis and Sjogren’s syndrome.